Raith Rovers have today finalised the loan signing of Rangers midfielder Jamie Barjonas. The former Scotland youth cap (who recently turned 20 years old) will play for the Rovers until the end of the current season. Rover manager John McGlynn said “I’m delighted to secure the loan deal of Jamie Barjonas from Rangers until the end of the season. Jamie is a creative midfield player who I’m sure will play a big part in our push for promotion. 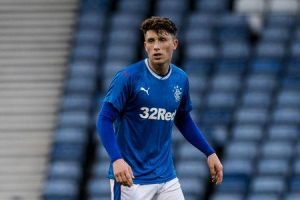 Jamie has been with Rangers since he was 9 years old, and signed a professional contract in March 2016. He has made 9 appearances (2 of them starts) for the Ibrox side. He spent time on loan at English League 2 side Bury at the start of the current season, making 4 appearances. Born in Leeds, Yorkshire, to Scottish parents Jamie’s uncommon surname originates from a Lithuanian great-grandfather.